I call BULL! We are invested in this parenting gig for a really, really long time. We are running the show, holding down the fort, steering the ship… however you want to put it. If we want to be able to manage this life as Mom then we have to take care of ourselves or we are going to crack. Finding, creating, demanding small spaces of time for ourselves has to be a priority. There is no waiting for when things settle down because things will never settle down. The time to start taking care of you is NOW! Luckily the hardest part is making the decision to find time for you. Since your reading this I would bet you’re on board. 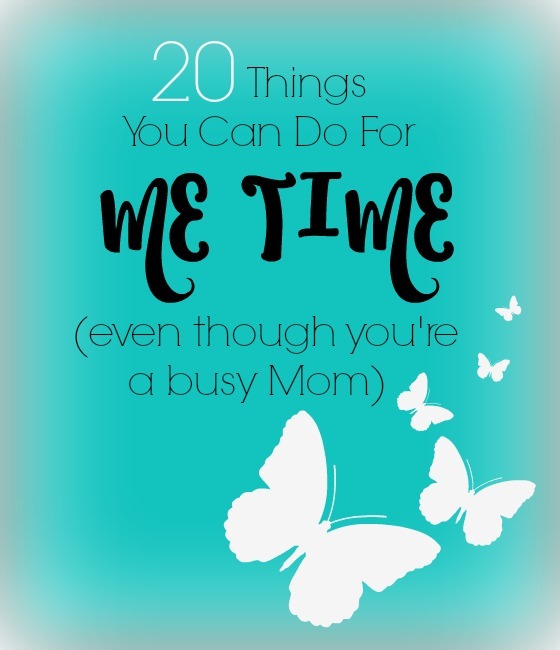 Use this list of me time ideas to get yourself thinking, read it a few times. 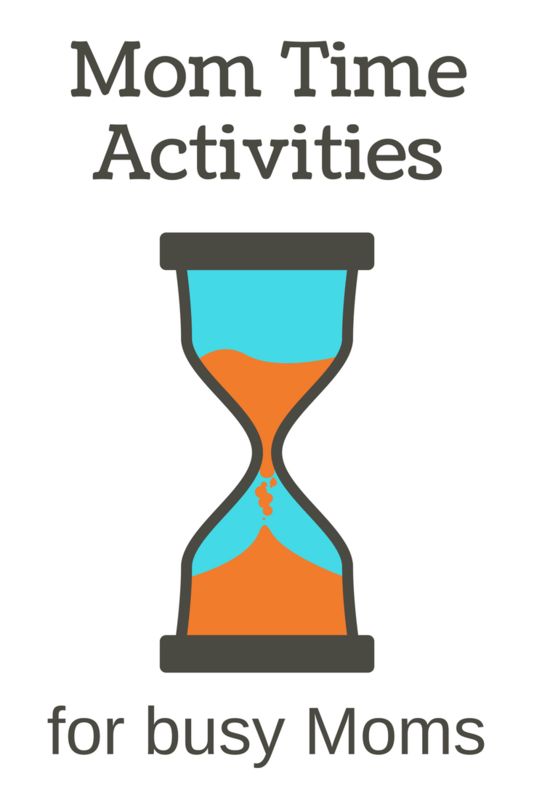 Jot notes of activities you can expand on or change a bit. Better yet tell us your plans in the comments to inspire others. Journal. Buy yourself a pretty journal and a grab a pencil. 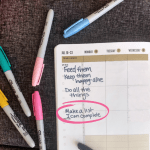 Just start writing or use journal prompts. Drink coffee out of your favorite mug. In quiet. Until it’s empty. No reheating required. Give yourself a pedicure. Enjoy a warm soak and sit still while the polish actually dries! Do yoga. Or stretch or lift weights or learn a new dance from someone on YouTube. Sketch. Try out the Tinkersketch challenge or just sit down next to your little artists and join in. Read a book. You know… one without pictures. Pick a fiction book or an inspirational book or a book that teaches you something new. Of course, if you enjoy reading books with pictures that’ll work too. Once you get started it’s amazing how many 5 minute reading sessions you can find through out the day. Fall in love with a new musician or group. Remember how fun it was to find a new artist? Once you started listening you just couldn’t stop! BREATHE! These three breathing exercises are simple to learn. They work for energizing, relaxing and meditating. Shop for fun. Round up a little when you tell Hubby how long you’ll be out running errands. Use that time to stop at a “just for fun” store or spend some extra time browsing your favorite aisle at the store you’re at. Listen to an audio book. Scrubbing the toilets is much more fun when it means you get to listen to the next chapter of your book! Meet a friend for breakfast. Breakfast and shopping. One of my favorite days of the week is grocery shopping day. That’s because I get up really early and meet my Mom for breakfast. We enjoy an hour of quiet chat time and hit the store just as it opens. It doesn’t affect anyone else and I get some me time! Watch a movie. Make it a rule that you fold laundry alone. Each load buys you about 10 -15 minutes if you fold really slow… hee hee. By the end of laundry day you’ll have watched the whole thing and be looking forward to full laundry baskets. Enjoy a hobby. Bring along something fun to do while you wait in the carpool line. Crochet, needle point or reading a magazine about your favorite hobby can all be done while you’re waiting. Join a book club. Find a local book club or join one online. Check out the book club for recovering readers, put together especially for busy Moms. Learn to paint. In our area painting studios are all over the place. They offer classes and open paint sessions. Find one and go! Meet a friend there or go on your own. Date your love. Ahhh, you remember him right? Well part of taking care of you is taking care of both of you. And that means dates. Sneak in at home date nights after the kids are in bed. See your friend. Some of your friends have kids right? Setting up a play date might not be exactly what you have in mind for a girls’ night but it’s still fun. Just make sure to plan some stuff that involves moderate Mommy involvement so the two of you can sit back and chat for a bit. Soak in the bath. With candles and enough music to drown out the noise on the other side of the door. It’s okay, and actually good, to claim sometime for yourself. You can give your family a time frame if that helps them feel better. And be strict about interruptions. After a few times they will know you mean business and figure out how to manage without you for a bit. Where can you fit in some me time today? Commit to it in the comment section and I’ll check in later to hold you accountable! Great list. Actually strolled around stores without the kids looking at possible things to get them for Christmas. I love this list. It’s easy to forget about yourself. I would love to take walks outside, but where I live there isn’t really anything within safe walking distance besides a small park. So it’s hard to go out without going anywhere. I see a difference when I do get up before the kids. But usually I cannot pull myself out of bed… with two of my three precious angels waking up way too often during the night. But I’m always ready to try and try again and so I will plan to wake up tomorrow an hour earlier! I find myself thinking quite often that if I take time for myself its being selfish! But today when I took my time doing my nails I felt relaxed! Thats the trouble with I never slow down for me! I love my family and work but I need to slow down. Getting over the idea that it’s selfish is a huge step! Way to go Debbie. HUGS! The selfish part really struck a chord. We feel guilty, every time, we decide to take some time to do something for ourselves. But what we do not realise is that by taking some time of for ourselves, we can recharge ourselves and go back to being an awesome mother. In my case, when I really feel like I need some me time then shopping, spa therapy and reading are the ones that top my list!